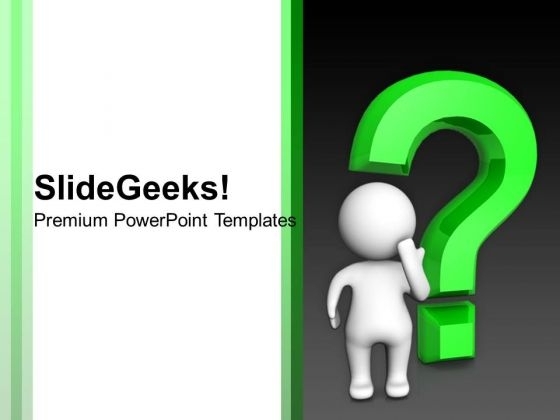 Doubtful Man With Green Question Mark Business PowerPoint Templates And PowerPoint Themes 1012-Deliver amazing Presentations with our above template showing a 3d man with a question mark representing confusion or doubt. This image represents business concept. This image has been conceived to enable you to emphatically communicate your ideas in your Business and Marketing PPT presentations. Go ahead and add personality to your presentations with our stunning template.-Doubtful Man With Green Question Mark Business PowerPoint Templates And PowerPoint Themes 1012-This PowerPoint template can be used for presentations relating to-"Doubtful Man With Green Question Mark, Business, Shapes, Metaphor, Symbol, Signs" Baseless fears can be a bane. Allay them with our Doubtful Man With Green Question Mark Business PowerPoint Templates And PowerPoint Themes 1012. Sharpen your point with our Doubtful Man With Green Question Mark Business PowerPoint Templates And PowerPoint Themes 1012. You will come out on top.